Aloha! I’m Jackie Menasco and I’d like to tell you a little about myself. My husband and I live in Peoria, AZ with our yellow lab, Lili. 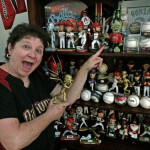 As you can probably tell from my photo, I’m an avid Arizona Diamondbacks fan and love collecting bobbleheads. When I retired after 40+ years as a teacher and professional developer in PreK-12 science education, I was looking for a challenging and thought-provoking hobby. So I thought I would experiment with genealogy. That was about 3 years and almost three-thousand family tree entries ago. Every day, I find myself learning something new. Whether it’s discovering Acadian exile ancestors (Cajuns), unlocking closely guarded family secrets through DNA, or learning how to blog, I am captivated and eager to learn more.